Jae Wa has been around for less than 20 years, but is certainly a contender to serving the best khao man gai (oily rice with chicken) in Bangkok. A lovely dish at it’s best, but terrible boring most places, due to a number of possible pitfalls. In 2011 CNN listed it as number 45 on the World’s 50 most delicious food. 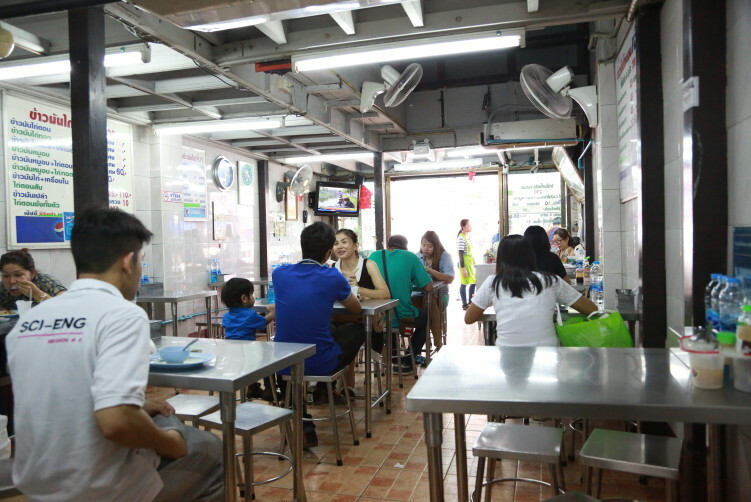 Despite being something like a newbie on the Bangkok food scene, the walls already have numerous press clippings praising the food, including a page from a Japanese magazine and a Perb-Pisadarn certificate from the famous critics Mae Choy Nang Ram. 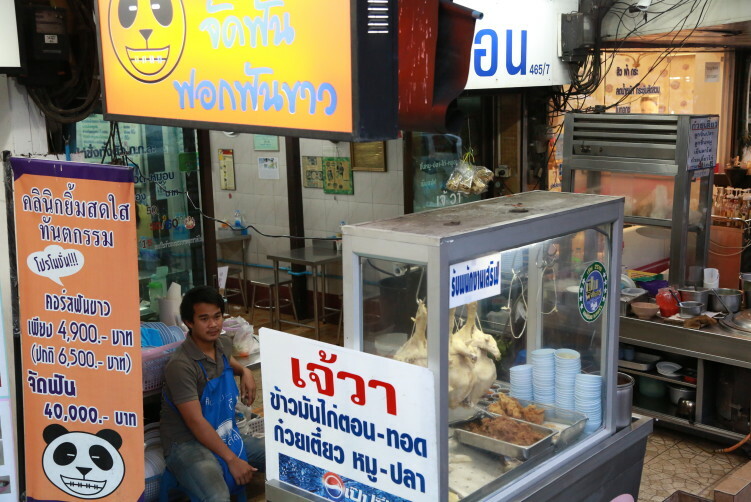 This in a city where there must be thousands of stalls and shop houses selling (chicken rice) khao man gai. But let’s take it from the beginning. It all started out in the Hainan province in Southeast China, before spreading to neighboring countries like Singapore, Malaysia, Thailand and to some extent Vietnam through Chinese immigrants where it was perfected to the local culture. Historically they preferred to use older, plumper birds to maximise the amount of oil extracted, and by that creating a more flavourful dish. But over time, it has changed with adopting elements of Cantonese cooking styles, such as using younger birds to produce more tender meats. Another Chinese variation, includes dipping the bird in ice after being cooked, in order to produce a jelly-like skin finishing referred to as “white chicken”, in contrast to the more traditional “stock chicken” or roasted chicken. Chicken rice is also considered a national dish in Singapore, where the meat is cooked by steeping it in water flavored with garlic and ginger, with the resulting stock used in the preparation of the rice and also in the accompanying soup. The dish was popularized in the 1950s by Swee Kee Chicken Rice Restaurant that operated from 1947 to 1997. How it looks from outside coming from BTS Victory Monument. In the most common Thai versions of khao man gai, the rice is boiled with garlic and oil in a chicken broth. This is served with slices of boiled chicken on top, together with a bowl of the “watery” chicken broth, a dipping sauce that is made from fermented yellow bean paste, chopped chilies and thick soy sauce. The few pieces of sliced and peeled cucumber gives color to the dish. Most places also offers fried chicken as an alternative, alone or together with boiled chicken, accompanied by a sweater chili sauce. The biggest pitfalls in making the dish are to not pay enough attention to the finest details in preparing it, and that includes the rice, the chicken and the sauce. The steamed rice cooked in chicken broth and chicken fat should not bee too oily or sticky. 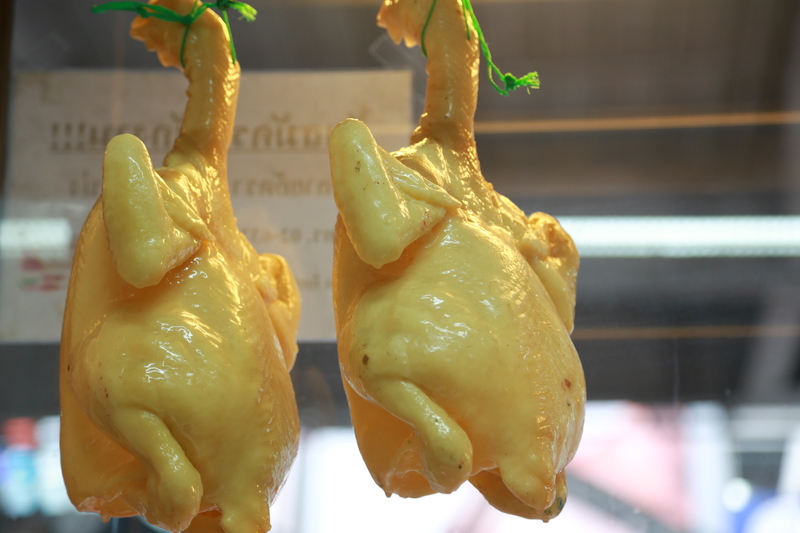 And if they haven’t used fat enough chickens the pieces easily gets a bit dry for my taste, especially when you know how juicy and soft it can be at Jae Wa and some other vendors. The best vendors use free range chickens and picks them out themselves, avoiding the large scale poultry farms. And then we have the sauce, a make or break for many lovers of the dish, most often made with yellow soybean paste (tauchu), thick soy sauce, chilli, ginger, garlic and vinegar. There are quite a number of variations when it comes to the sauce, but red chili infused gingery sauces or soy based sour sauces are both common. 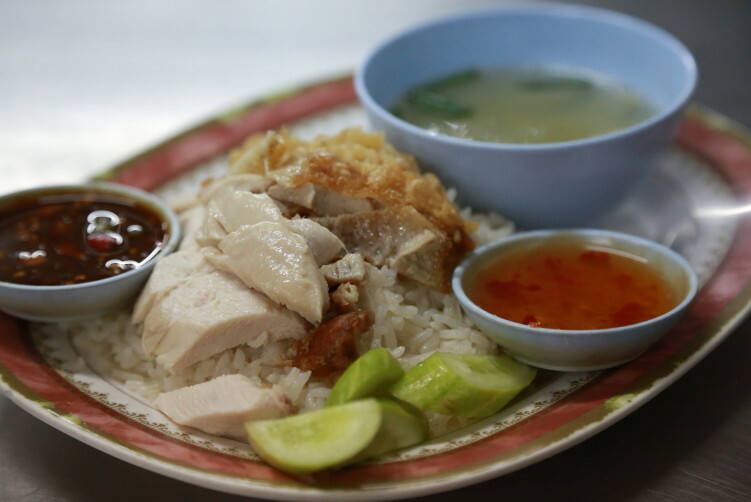 Chicken rice is not one of the more flavorful Thai dishes, and it would probably be one of the blandest dish available if it wasn’t for the dipping sauce. But with the sauce, harmony is reached and you have a beautiful dish. You always get a bowl of chicken soup along with your rice and chicken plate. Some serves you a clear soup, others are adding a few particles of chicken meat. I normally order the mix of both boiled and fried chicken to get a bit of variety. At Jae Wa it sets you back 50 instead of 40 Bath. A good deal in other words. And Jae Wa masters it all, serving a really lovely khao man gai. With some 50 vendors on the back, I have learned what to look for in this dish and it just doesn’t get much better than here. It definetively is one of the better once in Bangkok. 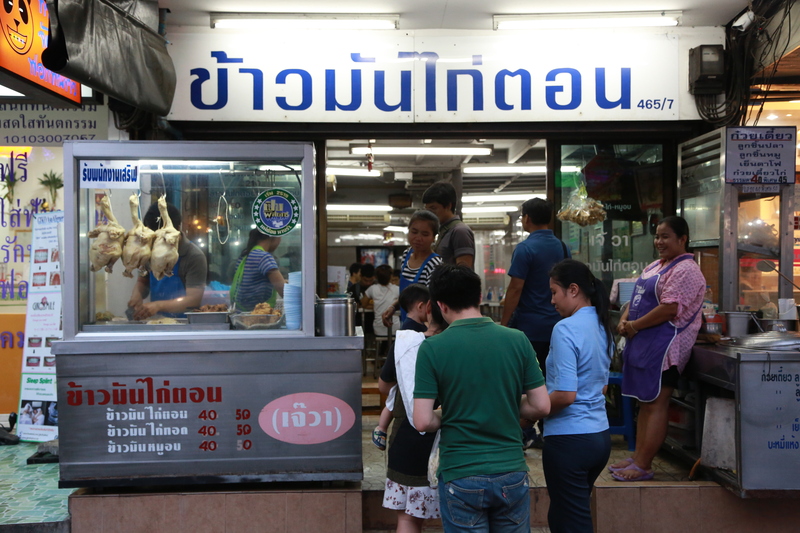 It’s easy to spot a Khao Man Gai vendors as you normally see the glass cabinet with the birds hanging by their necks. By testing out a few, you will soon discover the difference, but you should include Jae Wa in that list. here Open: 9 am – 9 pm. here Address: 465/7 Ratchathewi Rd. H0w to get there: Take BTS to Victory Monument. Walk north and around the roundabout on the right side. Make sure you follow the skywalk until you have crossed Ratchathewi road, then walk down to the street and you see it immediately on your left side. Opposite Center One.